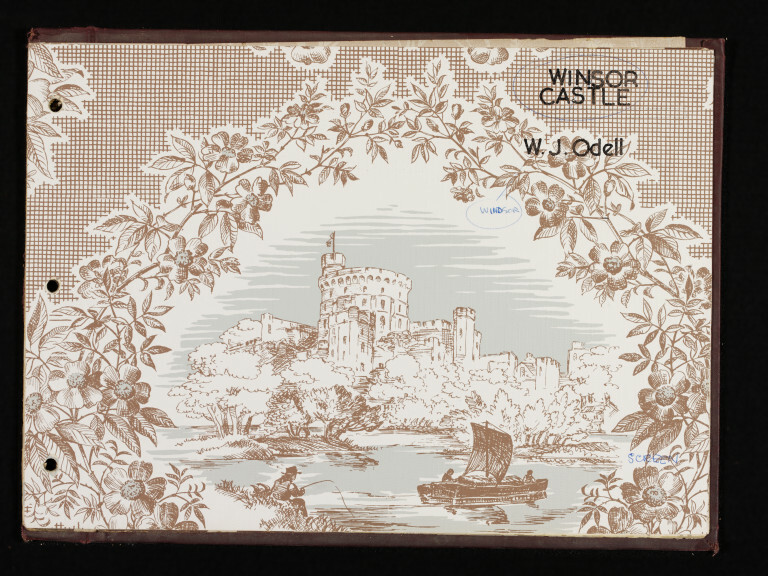 'Windsor Castle' wallpaper specimen, a scene of Windsor Castle within a round foliate frame, brown and pale-blue on a white ground; Screenprint on paper. Within a pattern book of 151 specimens, incorporating a studio log of obsolete designs, 1936-59; Each with title etc lettered on the front, and the pages of the original pattern book with title, serial number etc in letterpress on the back; Some of the patterns interleaved with screen-printed versions, reduced in size; Book bound in cloth boards, with typescript list of titles, designer's and printing methods affixed to the inside of the front cover and to the fly leaf. Lettered in black, top-right corner of sheet. Lettered by hand in blue ink, bottom-right corner of design. Lettered by hand in blue ink, correcting the misspelled title. 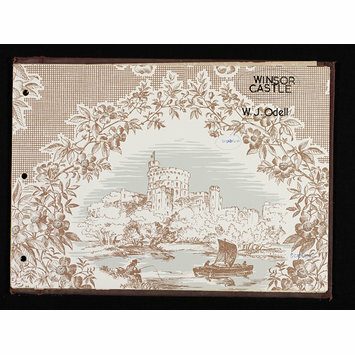 Given by Shand Kydd Ltd.
'Windsor Castle' wallpaper specimen, a scene of Windsor Castle within a round foliate frame, brown and pale-blue on a white ground; Screenprint on paper; Design by William J. Odell; Within a wallpaper pattern book of 151 specimens (E.2296-2446-1980), incorporating a studio log of obsolete designs; Produced by John Line & Sons Ltd; England; 1936-59.